BRIDGETOWN, Barbados, May 25, CMC – Barbadians dumped their frustration of the Freundel Stuart administration into the ballot box and elected the first ever woman to head a government in the country in an historic victory following Thursday’s general election. The preliminary results show that the Barbados Labour Party (BLP) is on track to sweep all 30 seats in the Parliament and BLP leader Mia Mottley said that she wanted to thank Barbadians for doing “what is best for Barbados”. The 52-year-old leader thanked outgoing Prime Minister Stuart “for his service to Barbados” but reminded the nation that “the people have spoken. “The victory is not mine, not the Barbados Labour Party, this victory is the people of Barbados victory”. She said that she wanted the victory to be recognised also as “a people’s campaign” and welcomed the new legislators who had embarked on “this special journey. “Leading this team has been the privilege of my life, it is now for us to move forward because the electioneering has stopped,” she said, adding that she wanted to thank all those who had offered themselves and had not successful. “I urge them to continue in the spirit of service and…in building this country,” she said, adding that she would begin the task of rebuilding the country “immediately. “There can be no time for gloating…moaning. We are one people, we are Barbadians and this should come as no surprise to you because…there is a time for healing because if we are to move forward and face the challenges before us we have to be prepared to heal and allow many hands to make light work. “As for the mandate you have given us…each of us will have a role to play,” she said, adding “we have no time but to get to the task”. The election was fought against the backdrop of a worsening economic situation in Barbados and Mottley said that in order to move forward her administration will release the latest International Monetary Fund (IMF) report on Friday so that Barbadians will know what is expected going forward. “We have also committed to releasing the noose of taxes around our necks…if this economy is to grow again, then… that will be business number one for us. “My friend, the task before us will not be easy. There is no elixir, there is no magical remedy, there is no single shock solution, but if we do not move with alacrity we will not succeed and what we have promised you is to stop the bleeding, but at the same time lay the platform for the transformation of our nation. “As it relates to the mandate you have given us, I am deeply conscious that in the absence of an official opposition in the House of Assembly we will have to evolve institutional arrangements to be able to allow Barbadians to have a greater say in the governance of this country,” she told the nation. Mottley said that the Cabinet, which will be appointed by Monday, reminded the country that “all ideas must contend. She said even before the government has a right to take a decision “all ideas must contend and we have already committed in our manifesto to putting in place a framework for people’s initiatives that come from you and are not started with us. “We have committed to referenda because we believe there are certain fundamental issues that we must consult with you on. Some will be binding and some will be advisory”. But she pledged “that there will be no gloating, that there is no way there will be a mistrust of the absolute mandate that you have given us, the people of the Barbados Labour Party”. She pledged also that her administration “would be your stewards at all times. 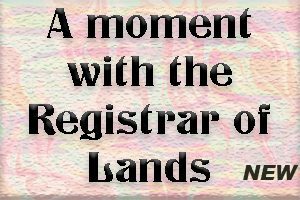 “Let us move forward recognising that this truly is a defining moment in our history. Not for what people will immediately assume about me being a woman, but more so it is about people claiming their future and the people of Barbados…have claimed their future with a new interactive mode of governance,” she added. Earlier, Prime Minister Freundel Stuart, 66, accepted “full responsibility” for the defeat of his Democratic Labour Party in the general election announcing also his move away from electoral politics in Barbados. “Let me unhesitatingly and unequivocally and frankly accept full responsibility for the defeat of the Democratic Labour Party in the election and let me assure all the party members that we govern in very challenging circumstances no previous government in Barbados has had to govern in circumstances quite like the circumstances that we have had to govern,” Stuart said in a concession speech. Stuart, who entered elective politics in 1994, said that Thursday’s general election would have been his last regardless of the results and that he would assist the party as it moves to name a replacement for him. Speaking at the party’s headquarters, Stuart said that his administration had to govern in a very challenging environment in the 21st century , adding “we did the best we could according to our likeness and according to our judgement over the very difficult and challenging decade in which we had to administer the affairs of Barbados”. He acknowledged that the government had to take some “tough and sometimes unpalatable decisions “but he remained confident that “in the fullness of time the wisdom of our actions be vindicated. “As far as the Democratic Labour Party is concerned, I think we have to when the dust has settled reflect on what has happened, try to determine why it has happened and take what corrective steps we deem necessary to ensure we start that process of necessary rebuilding and I am confident we have the human resources in this party to do it,” Stuart added. 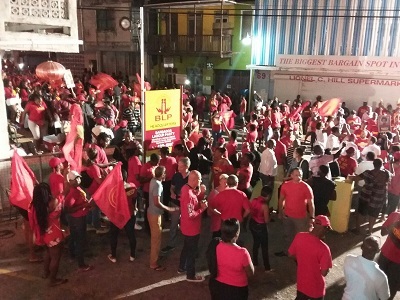 Hundreds of BLP supporters took to the streets during the earkly hours of Friday to celebrate the victory and Mottley said that she had urged the private sector to close down their businesses at midday.